Ferdinand and the other Lords agree to sign a very strict oath. Costard's sexual encounter with Jaquenetta is revealed. Don Adriano de Armado confesses to loving Jaquenetta and they talk briefly. He then moves on to punishing Costard. The Princess and her Ladies arrive in Navarre and are denied entry to the court because of the oath that has been sworn. Armado, lamenting his love, sends Costard with a letter for Jaquenetta. Biron then sends him with a letter for Rosaline. The Princess is given the wrong letter, addressed to Jaquenetta. There is a battle of wit between the Ladies and Boyet. Holofernes and Sir Nathaniel mock Dull. Jaquenetta asks Holofernes to read out her letter, actually meant for Rosaline. The Lords one by one confess to being in love as the others overhear. They decide to forget their oath and pursue love. Holofernes and Moth battle with language. Armado asks Holofernes to help him prepare a play for the Lords and Ladies. A lot of romancing occurs before a messenger announces that the Princess' dad has died and their love is put on hold. Strange, Lani. "Love's Labor's Lost Translation." LitCharts. LitCharts LLC, 19 May 2017. Web. 21 Apr 2019. Strange, Lani. "Love's Labor's Lost Translation." LitCharts LLC, May 19, 2017. 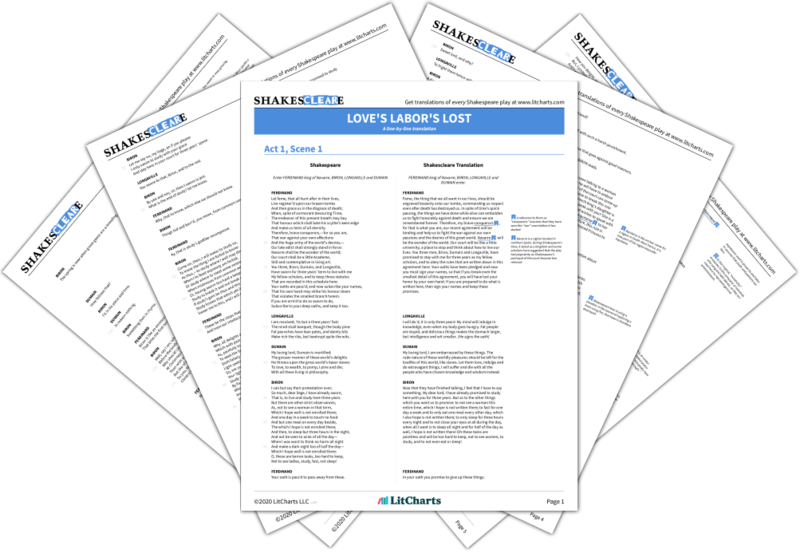 Retrieved April 21, 2019. https://www.litcharts.com/shakescleare/shakespeare-translations/loves-labors-lost.